Blog Gas Price Surge Of 2012 Is Over? Gas Price Surge Of 2012 Is Over? Over the last few days many news sources were chanting that the gas price surge of 2012 was over. They quoted Patrick DeHaan, senior analysts for gas buddy.com, who said, “By the behavior of the market, things are just running out of steam”… unless there is a major political event to reverse things, he thinks prices have peaked. Many websites are carrying this story and I’d be thrilled if he’s correct, $4 is plenty for my wallet. 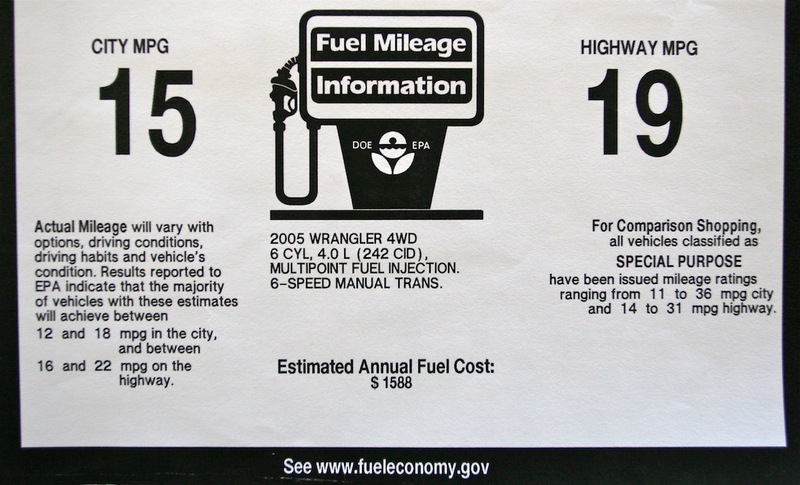 2005 Wrangler window sticker EPA estimate. With a little digging I did find alternative views, including the federal Energy Department that predicts that prices will still be 6% higher during the peak driving months of April–September 2012. These predictions are based on higher crude oil, which is down a little as I write this. I don’t follow crude oil prices, I follow the price at the pump and the miles from each gallon, something I have some control over through careful shopping and driving. I hope the fuel surge is over, all of us would welcome fuel below $4, and below $3 would seem relatively inexpensive these days. Anyone holding their breath waiting for a return to sub $3 gas?